Jason Monteiro December 20, 2018 December 21, 2018 No Comments on Will The Cost Of Your Mutual Fund Reduce? The fee charged by mutual funds has been a widely debated subject over the past few years. Mutual funds charge their fees as a percentage of the assets they manage on a daily basis. This annualised fee, which is known as Total Expense Ratio (TER), will fall significantly for mutual fund schemes with large assets (>Rs 5,000 cr) from April 1, 2019. Last year, Morningstar in a report stated that India’s average equity expense ratio of 2.22% is among the highest in the world. The Foundation of Independent Financial Advisors later challenged this finding in a separate report. As per their calculations, the average expense ratio worked out to 1.88% for Indian, which is the lowest among developing nations. As the market regulator, the Securities and Exchange Board of India (SEBI) knew the right thing to do, in order to encourage investor participation in Mutual Funds. In September 2018, SEBI announced that it would take steps to reduce the TER charged by mutual funds. Last week, the regulator followed through on its word, through the amendment of SEBI Mutual Fund Regulations, 1996. The new regulations will come in to force from April 1, 2019. The regulator has not only cut the expense ratio in the top AUM slab, but also restructured the AUM slabs considering the economies of scale. 3. The TER for index fund will be 1% from 1.75% earlier. 4. 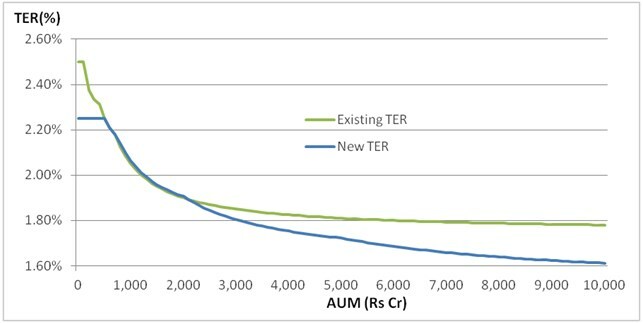 For Fund-of-funds, the TER cap will range from 1%-2.25% depending on the type of underlying fund. The slabs are more dynamic as compared to the current AUM slabs which have a cut-off at Rs 700 crore. Based on the above slabs, the TER for an equity fund with AUM above Rs 5,000 crore, hovers around 1.8%. When the new regulations come into force, the TER falls to 1.7% for Rs 5,000 crore and can go down to 1.6% for an AUM of Rs 10,000 crore. Here’s a projection of how the base expenses charged by equity mutual funds will be impacted. As can be seen in the chart above, there is a major reduction in expenses for equity schemes with an AUM less than Rs 500 crore. This is mainly because SEBI has reduced the expenses from 2.50% to 2.25% for the first slab. For an AUM between Rs 500 cr to Rs 2000 cr. there is an insignificant difference. The TER gradually reduces from 2.25% to 1.90% under both the old and new TER criteria for equity funds. As the assets grow beyond Rs 2,000 cr. the difference in the TERs widen. From a difference of just one basis point (bps) at Rs 2,000 crore, the gap between the New TER and Old TER widens to 17 bps at Rs10,000 cr. As seen in the table above, as the assets grow to Rs 20,000 crore the difference widens to 25 bps and as much as 30 bps for schemes with an AUM of Rs 30,000 crore. But how many mutual fund schemes in reality will be impacted? There are about 297 open-ended equity-oriented funds. Of these about 112 schemes or 37% of the schemes have an AUM under Rs 500 crore. Investors in such funds will see a sharp reduction in TER of their schemes. About 83 schemes have an AUM of Rs 500 cr to Rs 2000 cr. These schemes will not be impacted by the new TER rules. About 78 schemes have an AUM between Rs 2000cr to Rs 10,000 cr, such schemes will see a marginal reduction in TER. The reduction in TER may go up to a maximum of 10 bps. Just 23 schemes have an AUM over Rs 10,000 cr. Investors in these schemes will benefit from a reduction in TER. About 119 schemes or 40% of the schemes may see a reduction of over 10 bps in expense ratio. Of which 56 schemes may have to reduce their expense ratio by over 20 bps. Thus, if you are investing in equity schemes with a large AUM, you stand to benefit from a lower expense ratio. The reduction in TER is a good move for investors, as it will lower costs for investments in schemes with significantly large AUMs. Investors will now benefit from the economies of scale, leading to reasonably higher returns in the long run. Large AMCs with schemes above the Rs 3,000 crore-mark will face a reduction in revenue. Stock investors have priced-in this impact, leading to a sharp correction in the stock prices of HDFC AMC, Reliance Nippon Life AMC. Going forward, the strong growth of the mutual fund industry can largely be attributed to increasing financial savings combined with growing investor awareness of such products. SEBI’s reduction in expense ratios is likely to attract more investors towards mutual funds. Determining Nifty Direction! The Everyman’s Guide!